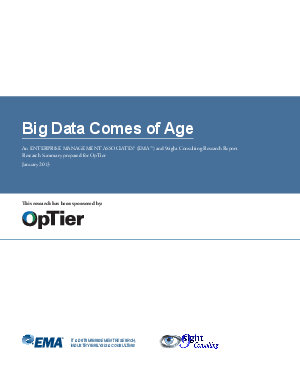 You'll find the respondents to the EMA/9sight Research Survey, conducted in 2012 on Big Data have clearly indicated that their Big Data solutions range far beyond social media and machine-generated data to include a wide variety of traditional structured and transactional business data. The report states that Big Data has driven change in most traditional data management strategies and has found a home in an expanding information ecosystem that many companies struggle to manage today. Over 36% of our respondents are In Operation with a Big Data oriented project. 35% are following close behind in Serious Planning mode. Download the report to learn more on how the core of this change is a movement to align data with operational and analytic workloads, each on the best possible platform.